Good news! You have just discovered the secret behind time and dimension travel. Bad news! Earth has been destroyed just moments later. Fortunately, another you that is a lot more qualified for battle enters this reality and vows to save the world using a team of highly skilled fighters. Due to the ability to travel in time these fighters can get trained up in seemingly no time at all and defeat the evil invaders in the short time between discovery and destruction. What could possibly go wrong? 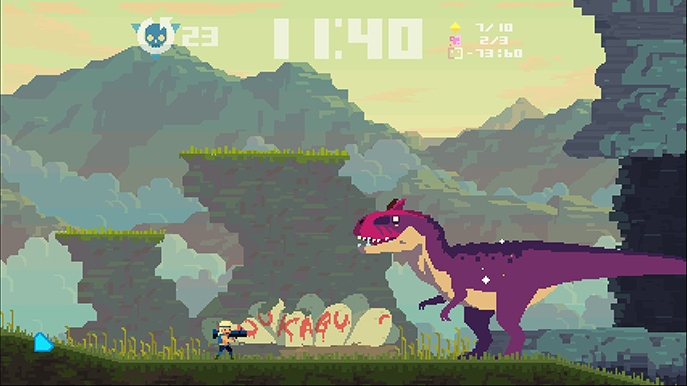 Super Time Force Ultra is an action game which requires you to complete each level within sixty seconds. While you are able to reach the end in that time, many enemies and obstacles lie in your way preventing you from doing so. 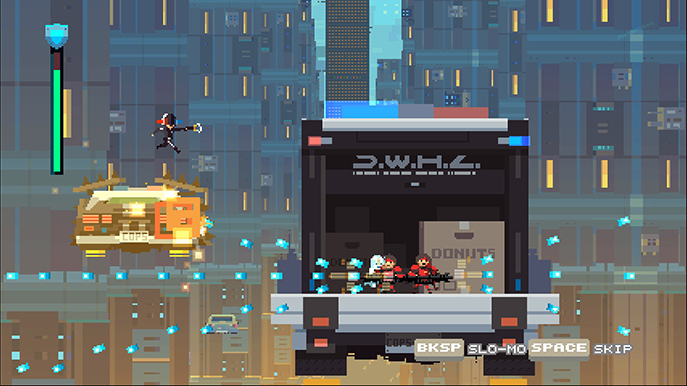 Using the time travel mechanic you can increase your firepower considerably and wipe these enemies out with haste; travelling back to any point in the level so far and choosing one of the many characters to aid your colleague. You can also choose the same character if you find their particular abilities helpful in the scenario. 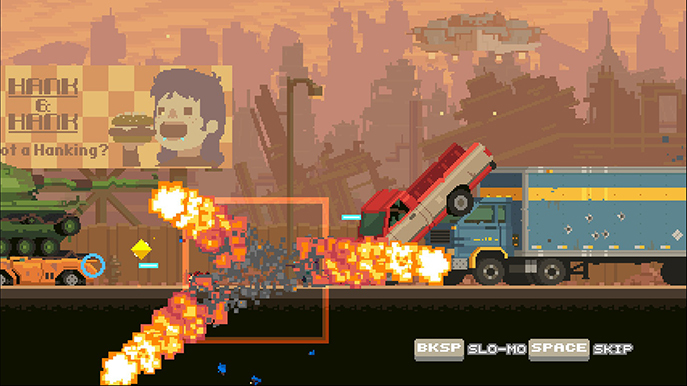 Saving Earth from destruction acts as the tutorial of the game. Once you have completed that mission your captain decides that Earth should now be improved; travelling through time and making changes that suit your ambitions and desires. For example; one of these is travelling back to the Mesozoic Era and prevent the dinosaur extinction; because who wouldn't want dinosaurs living in present times? There are six areas which you can play in any order, though there is a difficulty curve – the earliest being the easiest and latest being the hardest. 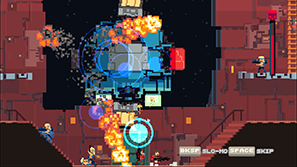 Super Time Force Ultra is easy to pick up and play but difficult to master. It is also a little difficult to get used to at the start but the lengthy and in-depth tutorial stages aid you very well in getting to grips with the game. You control one character at a time and can choose who you play as. Each character has a standard attack, a more powerful charged attack and a single jump. You begin with three characters: a machine gunner, a sniper and a defensive shield-barer. While this covers all your initial bases you unlock a good number of varied characters by finding them in secret areas of levels; you'll see melee, rocket, shotgun, pistol equipped characters and more. At any point in a level you can press B to stop and rewind time. You can restart at almost any point (not too close to where you died though otherwise you'd end up in some horrible death loop) and spawn a character at the feet of your previous fighter. If you die it kicks in automatically. At first you'll primarily use this ability when you die; but as you become more accustomed to the game you'll use it to greater advantage. You can take characters on alternate paths, destroy multiple enemies for safer passage and save previous characters from death. If you manage to prevent the death of one of your colleagues you can absorb their power through contact; so now unleashing your charged ability fires two attacks simultaneously. These stack up so you can become very powerful as a single character. 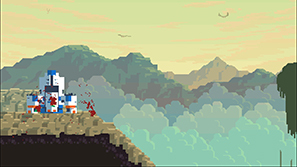 You also gain up to two lives for your character; you always start with a single hit death. One of the most striking things about the game is just how good it looks. 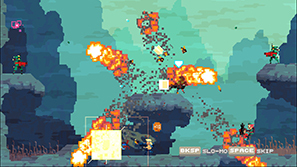 The pixel art is magnificent throughout the many varied environments and the animation is equally impressive. Everything runs smoothly and you'll have a great deal of characters and action happening on the screen at any one time. The locations are as fun to play through as they are to look at. The enemies and in particular the bosses have great visual design as well; my favourite being the giant octopus. Super Time Force Ultra does a really interesting thing in making itself feel fast paced and that you have to rush through levels. In reality, you could spend around thirty minutes in a single level. You start with sixty seconds on the clock and thirty time-outs. Due to the timer and the sheer amount of things blocking your path you initially rush in fear of not reaching the end and don't take the time to think about your options. It took me a few levels before I got out of that mindset and started to play the game more methodically. There are a lot of collectables to find in each level. There are 10 glorbs; you find these from destroying certain enemies or objects, and in secret areas. There are also usually three purple collectables that slow down time and give you an edge over your opponents and one multicoloured item, something I've not been able to find the significance of yet. While the game is relatively easy to play through – I only had trouble on two levels – collecting everything is a real challenge. There is still a level in the first world that I've only been able to find nine glorbs. It takes about five and a half hours to play through the game but considerably more to locate all the collectables. Only one part of the game frustrated me; the language. The characters talk in a tone that you'd find in some parts of the internet using words like 'lol' and 'totes'. This is a personal complaint as I find excessive use of that kind of language almost intolerable. It is tonally consistent throughout the game and a humerous contrast to the character's actions. I hope you're ready for puns too. So many puns. 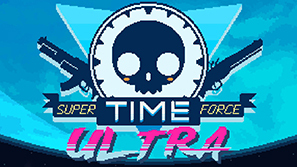 Super Time Force Ultra is a beautiful and tremendously fun action game that requires you to really think about how you play in order to gain the maximum from it. It's appears simple once you get used to the mechanics and pace but there is a lot of depth. The amazing visual design and animation are a joy to watch; screenshots really don't do the game justice, and the price point is very reasonable for the amount you'll get out of it.